We saw the future of Office on Thursday night. App by app, Microsoft is busy building its vision of “Office Everywhere”—universal apps that can scale to fill the available display space of a device. It's a major transition for Microsoft, and one that you wouldn't expect to negotiate without a few bumps. “We’ve literally transformed Office from a world of desktop apps—which everybody knew well—to a set of apps across different form factors that people can use regardless of what they’re doing and where they are," explained Jared Spataro, who's overseeing the individual Office app experiences. 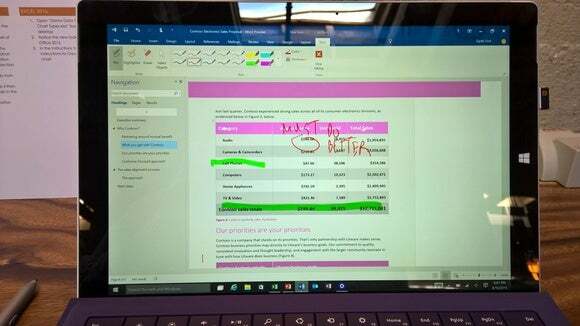 It started a year ago, when Microsoft launched Office for iPad, free apps artfully constructed for the demands of the tablet. Fast-forward a year: We have Office for the iPhone and Android tablets—and at the end of April, Windows 10 phones. Commenting is part of the Universal Office apps, although Track Changes are not. But while each app is impressively sturdy, it’s the mortar securing each app and platform to the next that needs to be strengthened. Let’s take a peek at the future, and five things Microsoft still needs to do to make this “Office Everywhere” work as it should. 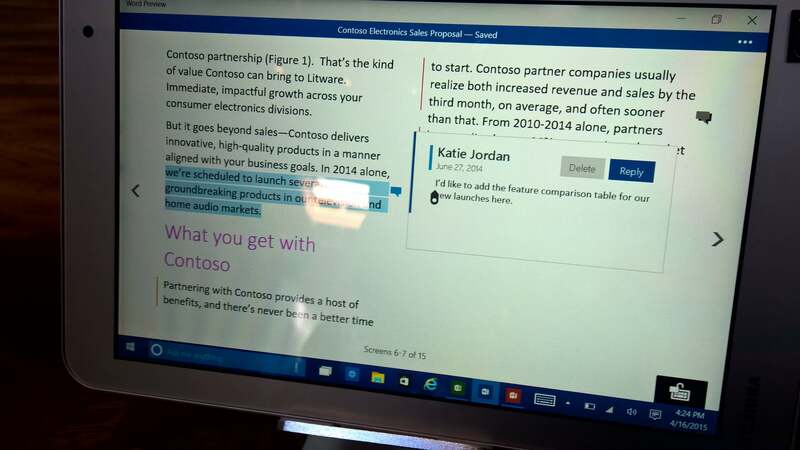 The new, touch-friendly Universal Office apps, including both Office for tablets and Windows 10 phones, boil down the desktop menu options to a few key topics. 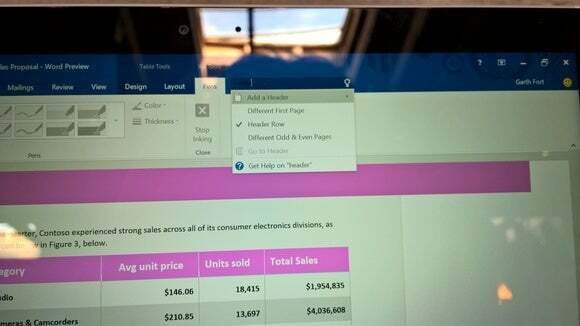 As we experienced on a Surface Pro 3 Thursday night, the impressive tablet experience uses a subset of the desktop menus in a larger font and a correspondingly larger “landing area” for fingers to trigger. In the touch-friendly Universal Office, you can touch otherwise small images and blow them up so they’re legible. 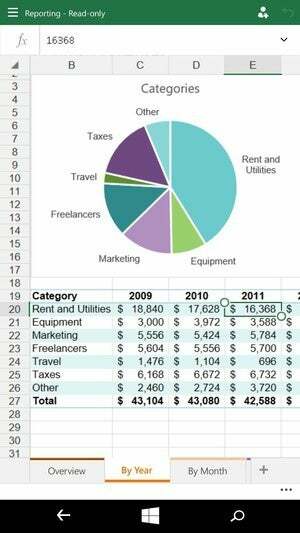 In reading mode, users can tap on a word and cull “insights” from Bing; they can also tap on graphics to expand them. You can slide images around a body of text, and the text will reflow. Navigating though PowerPoint presentations feels intuitive and natural. You can try these out for yourself. Microsoft’s “Tell Me” search bar doesn’t just tell you how to perform a specific function, it gives you the specific link to do so. Office 2016, meanwhile, will include such features as a redesigned “Backstage” experience to make it easier to create, open, edit, and save your files directly from the desktop. Outlook will make it easy to attach files from OneDrive without leaving the email application. Microsoft also promises Office 2016 will be more intelligent, with tools like “Tell Me” serving as an intelligent search bar to quickly cut through the menus’ complexity. What we saw Thursday night was a work in progress. Microsoft definitely has more to do to make "Office Everywhere" even better—and there's still time. Here are five things we'd like to see before these apps go live. While we typically refer to Microsoft Office as a single product, it’s actually a continuum of products split across several platforms: the standalone Office 2013 (and soon 2016), the free and cloud-based Office Online, and the subscription-based Office 365 are variations of the same core apps. Now there's the universal apps, too. Microsoft even refers to the new apps as “Office for Windows 10,” “Universal Office,” and “Office Universal.” Argh! If that's not confusing enough, the product roadmaps hardly help. Office Online is typically updated first, then Office 365, then the standalone version of Office—if the latter is eligible for an update, of course. I doubt Office customers anticipate new Office features with the same enthusiasm as, say, Windows 10. But unless you’re paying close attention, you can’t know for certain which version will receive which feature, and when. Microsoft needs to establish a timetable: Publish new features to Office Online first, then to Office 365 after a consistent interval—six weeks, perhaps. Microsoft's new universal Excel app for Windows 10 phones. The first Office apps for Windows 10 phones will incorporate both universal apps (Outlook Calendar and Mail) as well as the core apps (Word, PowerPoint, and Excel). My colleague Jared Newman and I disagree on how many hands are needed for a smartphone: I say two, he says one. But on Thursday, Spataro himself broke the impasse, saying Office apps on phones should be usable with one hand. By placing the important navigation elements (the Office “ribbon”) under an ellipsis menu at the bottom of the screen, they are. The problem is that the universal Outlook apps place the navigation elements at the top of the screen, as a row of icons. The new Project Spartan app does the same. I understand that the Outlook apps were designed by Microsoft’s latest acquisition, Accompli. Nevertheless, it creates an impression of inconsistency. Microsoft promised that its Continuum mode should enable a tablet like its Surface to present a desktop environment when docked, and a tablet-like environment when used as a tablet. Simple, right? So why doesn’t it work that way? Office 2016 maintains this look and feel, both docked and undocked. Stabbing these tiny numbers with your finger isn’t that fun. 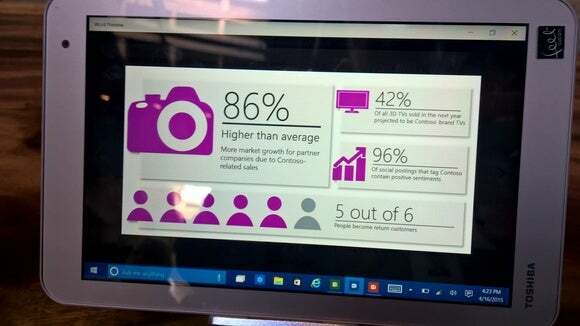 Microsoft showed off a Surface Pro 3 running Office 2016, which is heavy on IT-oriented features at this early stage. When docked to the keyboard, it worked as expected. But when removed...nothing happened. Shouldn’t it launch into the tablet interface of Office? Shouldn’t the interface change? Spataro agreed that it should, calling it “good feedback.” Maybe Microsoft will implement that change, eventually. 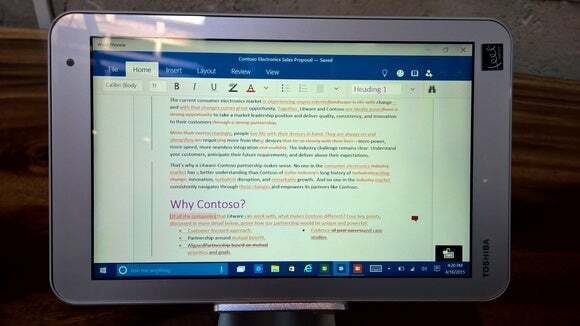 But for a device Microsoft calls a tablet that can replace your notebook, it’s baffling that Microsoft’s Office team didn’t consider that Office users would use the Surface as a... tablet. Windows users have long been forced to watch new features and apps come first to iOS and Android, and finally to Microsoft’s own devices. Let’s just move on. This would be a handy keyboard to add the Universal version of Excel. 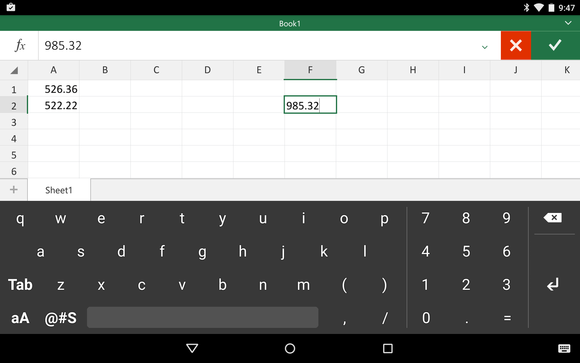 But Microsoft’s Windows Phone and tablet teams apparently didn’t communicate with its Android developers, who previously released a dedicated Excel keyboard which includes a number pad. Sure, spreadsheets contain text data as well as numbers, but the new version of Excel for Windows phones makes you tap the alphanumeric keyboard to enter the number keypad, and it doesn’t default to numbers when the cell is formatted for such. Spataro acknowledged this disconnect. Microsoft already hides a paywall “in plain sight” on its iOS and Android tablet apps, encouraging users who want to use advanced features to buy an Office 365 subscription. Microsoft has done the same with the Universal Office apps, Spataro said. I understand that Microsoft needs to make money, and that it’s trying to leverage its Office 365 subscriptions to do so. But baiting users with advanced features such as “track changes” and then trying to lure them to an Office 365 subscription feels like something a sleazy mobile app developer would do. If a version of Office doesn’t support a paid feature, don’t imply that it does. 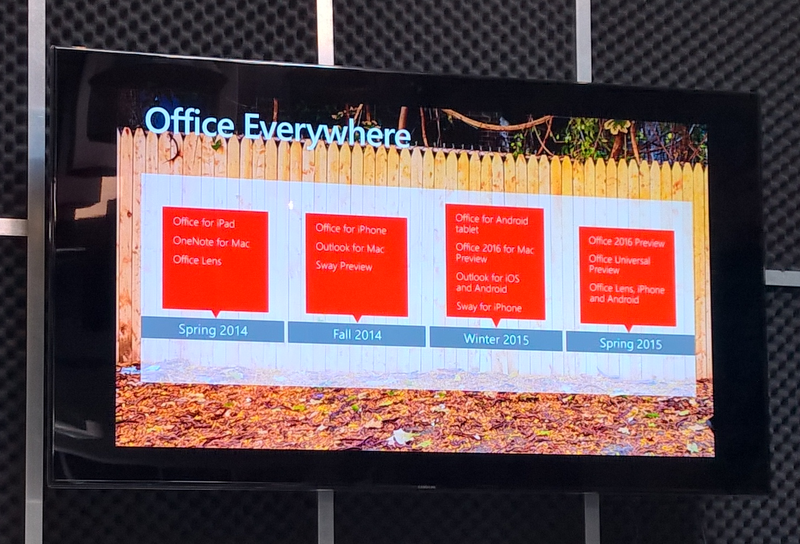 Microsoft’s Office roadmap over the last year. Let’s face it: Microsoft is a dinosaur of the PC era, hurriedly evolving to adapt to phone and tablet as the traditional PC slowly goes extinct. Meanwhile, the success of Web and low-cost mobile apps have left many customers wondering why they need subscription-based, multi-gigabyte Office suites weighing down their PCs. 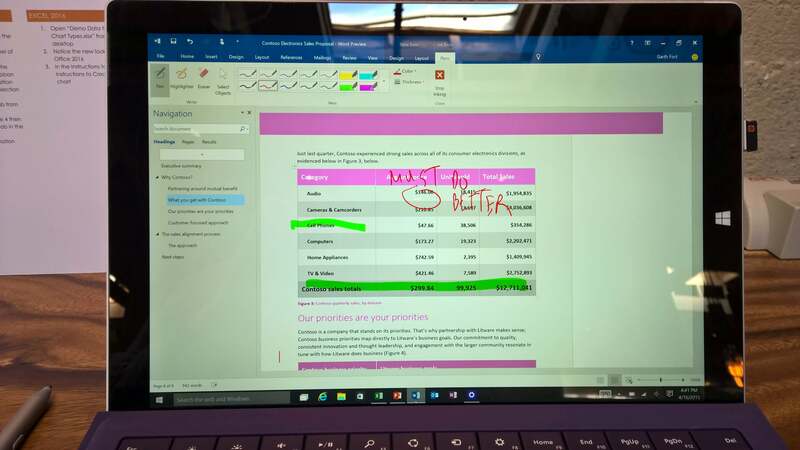 Microsoft’s Office innovations are arguably more exciting than they have been in years. But if each Office app is a brick in the foundation of Microsoft's new integration strategy, the company needs to build that foundation with stone, bricks, mortar, and cement—not papier-mache. As we observed Thursday night, there are still too many apps not doing enough for the user—not quite the vision of solidarity Microsoft would like. But there's still time, and we hope to see a more solid Office experience in the weeks to come. Updated at 10:27 AM to clarify that Microsoft showed off the Office apps for Windows 10 phones at the event.